"Book shows" like the Mask & Wig productions provide songwriters with a context. But when he wasn't writing for shows, Moe had to create his own context, turning to various sources for inspiration, adaptation and collaboration. In 1937, for example, Moe teamed up with Henry Tobias and Larry Vincent to write If I Had My Life To Live Over, a sentimental waltz that caught on after WWII when it was featured by Kate Smith, Buddy Clark and Bob Eberly, among others. Buddy Clark's untimely death in 1949 gave the title an ironic meaning, and his 1947 recording was taken out of play. In 1941, Moe, Nat Bonx and musician Jack Fulton adapted Anton Rubenstein's classical Romance, added lyrics, and called their version If You Are But A Dream. After Jimmy Dorsey and his Orchestra introduced the song (with Bob Eberly's vocal), it went on to take a permanent place among Frank Sinatra's greatest hits -- recorded on Columbia with Axel Stordahl's arrangement, and on Capitol with Nelson Riddle's arrangement. In 1944, Moe took credit for words and music, without collaboration, on Bell Bottom Trousers -- although he would freely admit that it wasn't an entirely original concept. For a hundred years or more, sailors sang a much bawdier version of the tune, much too "blue" for the times. Fortunately, Moe's cleaned-up version was tame enough for Ruth McCullough to sing when Tony Pastor's orchestra recorded the song. 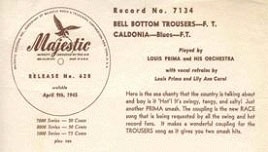 And additional recordings by Guy Lombardo, Louis Prima, Jerry Colonna and others made Bell Bottom Trousers Tune-Dex Digest's number two selling song for 1944-45 (second to Don't Fence Me In). With hits like that under his belt, it was time for Moe to say goodbye to Philadelphia, ease out of the band business, and establish himself geographically in New York. For awhile, he actually had an office in the famous Brill Building at 1619 Broadway, the spiritual heart of Tin Pan Alley. In the mid 1940s, he formed a business collaboration with Paul Kapp, a personal manager for musical artists. Together, they founded General Music Publishing Company, which had its first big hit in 1948 with Moe's songI'm My Own Grandpaw, co-written with Dwight Latham. Latham was a singer with The Jesters, a popular trio known for their novelty songs. He was probably the one who remembered an anecdote, attributed to Mark Twain, that described someone who became his own grandfather by marrying his daughter's step-mother. A more recent (and credible) attribution indicates that the song was based on a story called Singular Intermarriages printed in Charles Bombaugh's "Gleanings" in 1870. Whatever its origins, I'm My Own Grandpaw has been consistently performed and recorded ever since -- including a 2001 release by Willie Nelson.